(AP) -- A Paris court ruled Friday that Google Inc.'s expansion into digital books breaks France's copyright laws, and a judge slapped the Internet search leader with a euro10,000-a-day fine until it stops showing literary snippets. Besides being fined the equivalent of $14,300 for each day in violation, Google was ordered to pay euro300,000 ($430,000) in damages and interest to French publisher La Martiniere, which brought the case on behalf of a group of French publishers. The French case is relatively small in comparison. 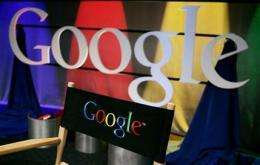 It didn't even seem to faze investors as Google shares gained $3.86 to $597.80 in Friday afternoon trading. Still, the ruling served as a reminder that Google's ambitious push into other markets beyond Internet search increasingly is clashing with fears the Mountain View, Calif., company is getting too powerful. As part of the backlash, Google has been depicted as a copyright scofflaw that prospers off the content of others - a portrayal the company's management insists is totally off base. "French readers now face the threat of losing access to a significant body of knowledge and falling behind the rest of Internet users," Colombet said in a conference call with reporters. "We believe that displaying a limited number of short extracts from books complies with copyright legislation both in France and the U.S. - and improves access to books."